Email marketing is a beautiful thing. It’s timely, targeted, valuable, measurable, relevant, and has the highest return on investment of any other marketing channel ($43.62 for every $1 spent, according to the DMA). When it comes to this revenue-producing, highly effective medium, it’s important to note that all email programs are different, and what works for you may not work for your competitors, partners, friends, etc. So, while there are many standard best practices, tactics, and strategies to suggest to marketers, it’s important to always be testing to see if that specific recommendation will work for you and your audience. But, there are a few noteworthy things that all email marketers should keep mind when it comes to building a successful program. Would you like one-on-one strategy and campaign advice from a Blue Sky Factory strategy consultant? Take your campaigns up a notch by contacting us today! 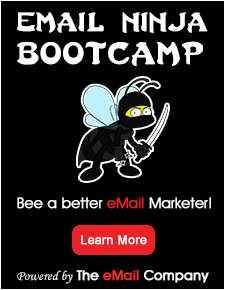 To most seasoned, savvy email marketers, this is a no-brainer. Unfortunately, there are many email marketers who either have no idea how badly purchasing a list can harm their business, or they simply choose to ignore this advice. To get positive results from your email efforts, it takes a strong, engaged audience. The only results you’ll see when purchasing a list (and essentially spamming everyone on it) is getting blacklisted by the ISPs, fired by your email service provider, and harming your business’s reputation. We can’t say this enough: do not purchase email addresses. Grow your list organically. Doing this over time may take longer than purchasing a list of 30,000 names, but it will produce more opens, clicks, and conversions, and makes it more likely for your subscribers to keep coming back for more. Trust us on this. Still not convinced? 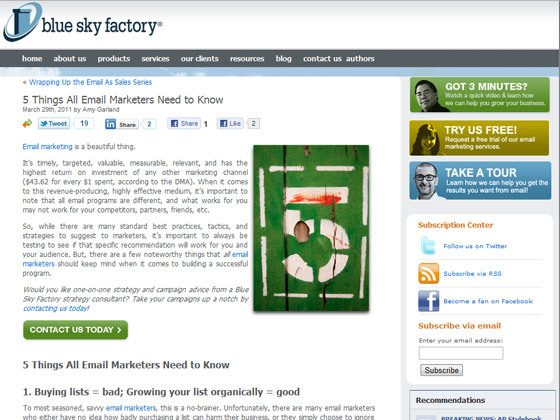 Read “When is it Okay to Buy an Email List?”, the shortest Blue Sky Factory blog post ever written. Get 50 ways to grow your list now (a free Blue Sky Factory eBook). Do you believe that one of our clients dropped 84% of subscribers from their list, yet saw an increase in engagement and sales? Believe it. Read more about COMP Performance Group’s re-engagement campaign, which took them from almost 58,000 subscribers to just under 10,000. Shocking numbers, right? Actually, no. Their list is more engaged, their open rate has increased, and conversions (sales) have been steady and ongoing. Everyone knows why sales are important, but I bet some of you are wondering why engagement matters so much. The ISPs (Internet Service Providers, think: Yahoo!, Gmail, AOL) determine whether your email gets through to the inbox, and they’re now looking at engagement when doing so. They want to make sure your subscribers are clicking through, sharing, and simply interacting with your emails; the way they determine this is by looking at your metrics (this is why it’s important to get rid of the dead weight). How many people on your list are opening, clicking through, and sharing? Run a re-engagement campaign, offer preference centers and frequency options, and segment your list. Quality over quantity is more important than ever. Content. Explain the type of content you send. Is it a newsletter? Do you provide deals and discounts? Let potential recipients know what they’re signing up for. Frequency. Tell subscribers how often you will send them email (include this information on your opt-in form and in your subscriber preferences center). Better yet, let them choose the frequency at which they can hear from you. At Blue Sky Factory we provide a weekly newsletter, but subscribers can sign up for a monthly summary if they’d prefer that instead. Look & Feel. You can even show people what your emails will look like so that it will be easily recognizable to them. Also, tell them what from address and from name you use so that they can whitelist that address and recognize the from name when you send. The key to setting expectations is actually following through with them. Make good on your promises, and your subscribers will love you all the more for it.